The Jackson Laboratory mice share 95 percent of the same genes as humans and have become an effective and efficient model for genetic research pertaining to human diseases. One of the world’s leading distributors of human disease mouse models is The Jackson Laboratory, an independent and nonprofit biomedical research institution with locations in Bar Harbor, Maine and Sacramento, California. Jackson’s mission is to discover the genetic basis for preventing, treating and curing human diseases. Jackson also provides educational and research resources to the worldwide biomedical research community by serving as a global collection and distribution point for valuable mouse models of human diseases through its JAX® Mice & Services division. Currently, Jackson provides over 5,000 varieties of mice, with approximately 135 strains in active production colonies, an additional 1,000 strains in small live colonies and the remainder available as cryopreserved germplasm (sperm or embryos) which can be readily recovered upon request. Their repository has more than 2,100 targeted and 1,000 transgenic mutant mouse lines with 500 new lines imported each year. Many are models for cancer, heart disease, Alzheimer’s disease, ALS, diabetes, Parkinson's disease, spinal muscular atrophy, Huntington's disease and various autoimmune diseases. To better serve the biomedical research community and increase its capability to manage the health of a growing number of mouse lines, Jackson opened a new 22,500 square-foot Importation and Isolation Facility with a 5,000-cage capacity quarantine room for receiving, housing and processing all imported mice of unknown health status delivered from institutions around the world. In the quarantine room, Innovive disposable caging is used and each week technicians perform complete cage changes on every mouse — checking the animal, removing old bedding, feeding and watering and taking blood samples. Because each cage is considered a contaminant due to the unknown health of the mice, it can only be opened and changed within a biological safety cabinet. To protect the safety of the technicians and the mice, it is critical to keep the work environment absolutely free from contamination. Changing the cages in the old mouse importation building was inefficient. It required moving the cages to stationary biological safety cabinets situated on the room’s perimeter — a difficult task given the heavy cage racks had to be moved 20 to 30 feet, locking and unlocking them along the way. As such, the new Importation and Isolation Facility presented an opportunity for Jackson to improve workflow efficiencies in the quarantine room and assess the equipment utilized in order to make the cage-changing process faster and more ergonomic to help reduce repetitive motion injuries and fatigue. During the design phase, engineers and facility managers from Jackson worked closely together to develop a new workflow process. They concluded that a biological safety cabinet, which could be accessed from both sides and placed in line with a row of cage racks (instead of at the end of an aisle), could create a more ergonomic and efficient cage changing process. Ability to meet an aggressive timeline to have the new biological safety cabinet tested and ready for operation before opening of their new facility. 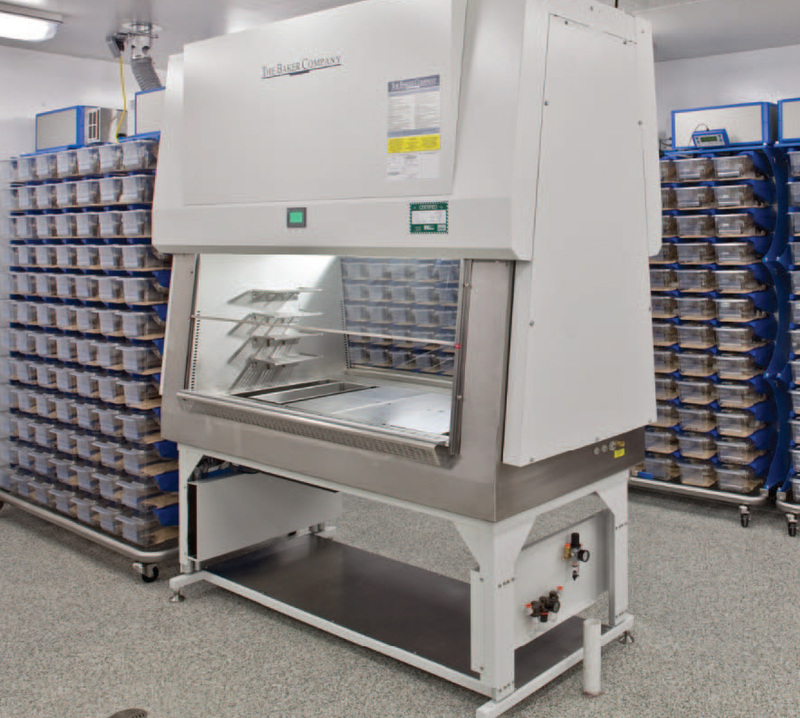 Animal facility managers and engineers from The Jackson Laboratory and engineers from Baker began working together to design the SterilGARD® Duo Biosafety Cabinet. The collaboration tool place while the new Importation and Isolation Facility was being constructed and the new workflow process for the quarantine room was only in the planning stage. "It took signifigant collaboration to bring this project about," said Rick Burne, senior project manager, The Jackson Laboratory. "Many of the biological safety cabinet manufacturers we spoke to tried to push me into a cabinet that already existed with some modifications." Burned continued: "I knew that approach would not work and that we had to start from the ground up, because what we were proposing was a completely new idea. In the end, Baker was the only company that would do this with us. We worked closely together as a team making minor adjustments throughout the design and development phases of the SterilGARD® Duo Biosafety Cabinet. It was a great process and Baker listened carefully to our requests and delivered exactly what we needed." Want to create a Partnership?